Many girls, when getting married, paint a following picture of a beautiful life in their imagination: after a few years of marriage my husband will make a career or create a business, I will have children, the husband carry me on his hands and forever feel grateful to be with me. In reality, it turns out to be opposite. After a few months of living together, wives start to complain that their husband turned out to be greedy, is not interested at all in her life and she does not even want to talk to him. “Weather” in the house deteriorates, if the baby is born in the family. As the birth of a child strengthens the family only when love and understanding reigns between the spouses. Where there are no deep feelings, the child won’t stop from a divorce. With the birth of the child in such families, relationships are exacerbated even more. Before we look into the problem of family to strengthening, I’d like to tell you a Polish proverb: “In a small town teacher lived – old sage. Once he saw that his pupil has caught a lot of fish, cooked it and now was eating it. The old sage asked his disciple:” Why did you put so much fish in your bowl?” His student replied: “I love fish”. Master shook his head and said: “If you love fish, you would have left it in the water. And her I see you love yourself and your stomach. Do not talk about your love to fish, when you enjoy eating it.” Here lies the problem of relations in many families. Love, which many couples are discussing, it is not an actual love. More precisely love, but not to you wife, – rather to yourself. True, real and eternal love to yourself. Often this type of love doesn’t know any boundaries, and becomes the cause of the collapse of the family. From birth, the girl wants to marry a “prince”, who will ensure a happy and rich life for her. And all this she imagines to be love. In fact, the marriage with such an attitude to family life is doomed, because it is similar to the trade agreement: I told you – you tell me. To avoid falling into such a situation, I strongly recommend downloading the book “Never Lose Him“. 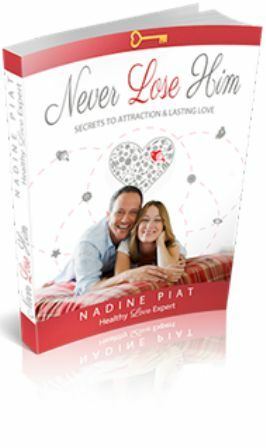 This practical guide will show you how to build a relationship with your loved ones. Be sure to get this book if you care about your personal life. We’re not going to blame all the girls in selfishness and inability to love. Nobody taught them from childhood to think otherwise. Everybody around them spoke of love, but nobody actually showed how to see it. So, the girl takes a “love to fish” for the real feelings, and quickly subsides romantic veil and bitter disappointment comes after marriage to her eyes. Payment for this error becomes a long married life, when two strangers oblige each other to live under the same roof. Getting out of this impasse can only be filing for divorce, what many couples do not dare to do because of possible serious injury to a child or because of fear of losing something that over the years was amassed in their marriage. Family is a big job. Therefore, it is necessary to get married to the person whom you are willing to accept as he is and while living together try to make him better. Only the one in whom we put energy and effort becomes every day more and more beloved for us.